(UM Legislative News Service) “Beef. It’s What’s for Dinner.” Millions have heard the slogan. They’ve also watched several decades of celebrities, from Brett Favre to Beyoncé, donning iconic white mustaches during “Got Milk?” spots. These culturally ubiquitous ad campaigns come from programs that collect funds from ranchers and farmers for investment in research and marketing intended to generate even more dollars in the long term. It’s called a checkoff, and Montana has its own for wheat and barley. A bill sponsored by Rep. Ross Fitzgerald, R-Fairfield, will double the maximum cap on how much those grain farmers can be charged for the checkoff. Gov. Steve Bullock signed it into law last Wednesday. Though the checkoff is little known outside agriculture circles, supporters say it helps keep Montana growers in the black — particularly amid global trade wars and a changing climate. Supporters included the Montana Grain Growers Association, Montana Farm Bureau and Montana Farmers Union. The Legislature created the checkoff in 1967 at the direction of farmers who wanted to spend their own money developing markets. The assessment is voluntary, but fewer than a half-percent of growers traditionally request refunds. Fitzgerald said that’s because of the program’s track record, but also who actually controls the money. Instead of bureaucrats, a seven-member board of farmers within the Montana Wheat and Barley Committee budgets checkoff proceeds, which equaled roughly $4 million last year. The board also raises or lowers the assessment. However, since 2009 the checkoff has been at its ceiling: 2 cents per bushel of wheat grown and 3 cents per hundredweight of barley. Though the assessment has historically represented half a percent of the grain’s value, it’s now at about a third of a percent. An increase in the checkoff cap — which has only happened in 1983 and 2003 — will provide farmers more flexibility in addressing ongoing priorities in the volatile farming world. Much of the committee’s budget, $1.7 million, went toward wheat and barley research last year. Most of that money goes to Montana State University. Why continue to improve crops that have been cultivated for thousands of years? Montana could stop trying to develop better crop varieties, but Idaho and North Dakota wouldn’t follow suit. In part, the checkoff funded Talbert’s research into what became Montana’s most popular spring wheat variety. It also allowed a colleague next door to develop the state’s most common winter wheat variety. Scientists aren’t just motivated by higher per-acre yields. “Facing extreme conditions with climate cycles, we need more research in drought- and disease-resistant crop varieties,” Fitzgerald said during a recent committee hearing. It can take a decade to develop a new product; the checkoff represents a stable funding source that doesn’t ebb and flow with the Legislature’s budgetary priorities. That also makes the checkoff an effective marketing tool, according to Montana Wheat and Barley Committee Bureau Chief Collin Watters. Eighty percent of wheat is exported to other countries. Like research, Watters said, developing new markets takes sustained, patient effort. Last year, the committee budgeted $1 million into market development. Establishing new markets is especially necessary given economic uncertainty amid recent trade wars. 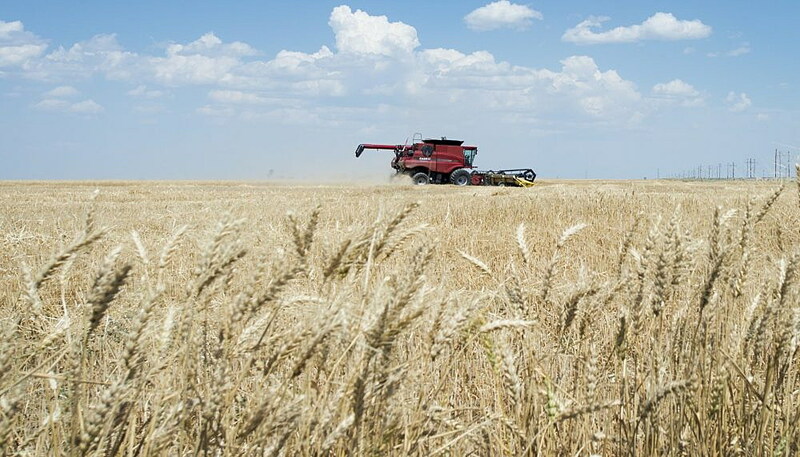 China, traditionally a significant market for Montana spring wheat, didn’t purchase any last year due to tariffs slapped on the U.S. in retaliation for trade restrictions the Trump administration imposed on Chinese goods. U.S. wheat sales to Japan — the largest American wheat importer of the last five years — are also set to plummet. The Trump administration decided against joining the massive trade agreement succeeding the Trans-Pacific Partnership, unlike Australia, Canada and Japan. The first two countries can therefore sell wheat to the third without markups, providing little reason for Japan to purchase the more expensive U.S. product. So Montana wheat needs somewhere else to go. The committee pays for memberships to groups like the U.S. Wheat Associates, which has nine foreign offices that serve as headquarters to establish new markets. The organization, and others, provide Treasure State growers an international presence that would be prohibitively expensive to establish themselves. Watters said the committee doesn’t yet have plans to raise the assessment. International politics have persuaded them to seek the option, however. Kevin Trevellyan is a graduate student at the University of Montana School of Journalism. His work has appeared at Montana Public Radio, Idaho Falls’ Post Register and other news outlets. His email is kevin.trevellyan@umconnect.umt.edu. The UM Legislative News Service is a partnership of the University of Montana School of Journalism, the Montana Newspaper Association, the Montana Broadcasters Association and the Greater Montana Foundation.